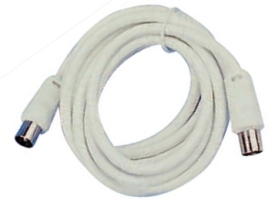 An Aerial Flylead is used to connect from a TV aerial socket on the wall to an aerial input socket on a TV or set-top box. They are also used to connect set-top boxes and recorders to TV sets. These will have a male aerial plug at each end. TV Aerial Flylead at Maplin. Aerial lead with a male socket at one end and a female connector at the other end. TV Aerial Lead at Maplin. Got a damaged aerial connector? 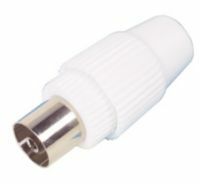 Replace the male connector plug with a co-ax plug. Basic co-ax plug at Maplin – see also all aerial connectors at Maplin. See our dedicated Aerial Splitter and boosters page. If you need to connect a set-top box or a DVD player to a TV set, you’ll probably need a male-to-male SCART lead. You can buy a basic SCART connection lead at Maplin, or you may want to invest in a higher-quality SCART lead, which you can get from TV Cables. F-Plugs are most commonly associated with satellite TV or cable TV systems. They have a screw thread. Pictured below is a male plug on the left, and a female on the right. For cables and connectors, go to a maplin.co.uk or tvcables.co.uk. Typically used to connect a High Definition set-top box or DVD player to an HD-Ready TV set. We have a page dedicated to HDMI cables, connectors and converters. See our HDMI advice page. Can be used to connect some types of set-top box to a TV set. Red, Green and Blue for Y,Pb,Pr component connectivity. Note that these carry video only, not audio. For Component connectors and adapters, go to a maplin.co.uk or tvcables.co.uk. 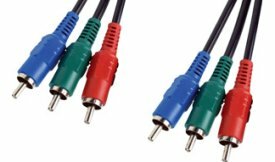 Three leads – red and white for stereo audio, and yellow for video. For connectors and adapters, go to a maplin.co.uk or tvcables.co.uk. Co-ax Explained A co-ax plug is the kind you’d expect to find on the end of the wire that comes from your TV aerial. 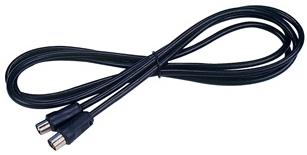 For a selection of co-ax leads, converters and extensions, go to the Maplin website. For a selection of SCART leads and switch boxes, go to the Maplin website. HDMI explained HDMI stands for “High Definition Media Interface”. This is the connector used to connect most high-definition equipment (such as the Sky+HD , Virgin V+ or BT Vision box) to a hi-def TV set. HDMI cables carry both video and audio. See our HDMI advice page for more. How can I connect my Freeview box to a PC monitor? If your Freeview box can output RGB via SCART, then get a SCART to VGA lead like the SCART to VGA SyncBlaster cable from Maplin , or the Video to VGA converter from TV Cables. I’d like to use remote earphones with my TV but it doesn’t have an earphone socket. What other outputs does your TV have? I just picked up (in fact,it took 2 of us) a SONY KDE P37XS1 Plasma TV as a second set,and THOUGHT it would be a simple matter to connect up my Desktop Computer,BUT no,as it doesn’t have a VGA socket. Some say it can be connected,others say it can’t…got any Aspirin? With what LOOKS like 3 different Ariel connections. So,my question to you is…can you please direct me to a site that will explain these cables (unless you can)? and do you think I can get a cable to connect this TV to a computer,such as a VGA to?. Hi We had Scart leads put into the walls so that when we hung the flat screen tv there would be no wires until much lower down where we would place the tv hub and recorder etc. I now have a new tv provider which only gives an HDMI lead. Is there a converter that allows a male scart to plug in and then have an HDMI lead which will plug into the TV provider? can I run x3 tv sets from one outside ariel? the wall plug is a F connector. How do one connect to a HDMI port? My problem is that the building manage supply TV programs to my apartment thro’ this F plug, thinking of buying a darblet day 5000 to improve the picture. Hello I just moved to UK from Italy and need advice on how to plug my TV. there’s a Co-ax aerial Socket in the wall, I connected it with a co-ax cable to my TV but there is no signal. on the wall there is also a F plug connector. does this mean the co-ax cable does not work anymore and I need to try and plug on the F plug? so what should I do in order to see the standard channels of british TV? I forgot to mention, it is an italian TV with only co-ax plugh and SCART plug. If it’s a TV that is older than two years then u need to get a free view box. Otherwise u just tune u r TV into the area. Being bought in Italy would have nothing to do with it given most tvs and electronic good come from Asian countries like China or tyain or Tokyo. Where they’re made is irrelevant, but different countries have different TV standards. There are uncountable variations on PAL (B/G/I), and then there’s SECAM (France). Wondered if you could help please? I have bought a 2nd hand technika 19″ tv/dvd combo. I would like to use it with headphones but it has no headphone jack. I am not bothered about using the tv, just dvd. I have read about various converters etc and tried a few things but all without success. The set has scart, y/pb/pr, hdmi, vga and s-video sockets and also two audio in sockets but no output. Would a scart block with 3 phono sockets do the trick as I am not using the scart lead? so I can have one lead into the back of the set . I have changed from a sky box back to freebies. Can I buy an adapter to change my two lead aerial lead for sky box to a one lead for free view. No. But you can buy Freesat box instead of Sky and receive free to air sat channels. I have changed from a sky box back to free view. Hi! I have a question. Is it possible to solder two wires in one. If I have abb (http://hardware.eu/abb) and inside it there are 4 wires more? How to know which wires should be connected to each other? Hello, is there anyway possible of converting a sega megadrive/genesis (coax) to an HDMI output? No you can not. The signal needs to decoded by the TV tuner. My TV aerial lead is male one end and female the other. However, the TV and the socket on the wall are both the same, male or female, not sure which, how can I connect my TV? Both my Digital antenna and my HDTV (Vizio) have male connectors. I purchased an “F” connector to pair them, but it is too large to screw into either the TV or the Antenna cable. Is there a special connector for this purpose? Thanks. What is the name of the cord that plugs the TV into the wall? I lost mine and can’t find one. I have a dish outside the house and the cable I can see in is a set of 3 cables with the socket and a needle in them, can someone help me as to what type of coaxial cable I need to buy to watch the freeview channels, the TV has built in speciality so don’t need a freeview box, etc. You need a TV aerial to receive freeview. Sat dish won’t work. Just bought an Atlas 200-se satellite receiver here in Spain,only instructions are in French & Arabic.Any idea how to connect cables to TV? old box had cart to scart but new box has no scart possibility. Hi all I have just moved to a new property that has a digital tv aerial and a built in connection point. 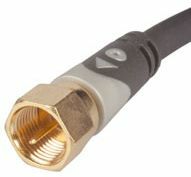 The point has 2 x coaxial lead and 2 x digital see in lead connecters. My tv has 1 x coaxial and 1 x digital connection socket. I have tried to get a signal through a single coaxial lead and tune the tv but to effect. Can anyone help as to the way to get a signal to my tv through this set up.